No more doctor appointments for prescription. No more lab visits for blood draw. Let us take care of all that while you work on things you love. Normal TSH Levels: What’s Normal & Why? The male health test will measure four key hormones for men using a saliva sample: Testosterone, DHEA, Cortisol, and Estradiol. A physician will review your results for healthy levels based on your age and life style. What is an At Home Male Health test? The Male Health Test measures hormones essential for men’s overall health. A balance of these hormones affects muscle strength, bone density, weight gain, and the healthy aging process. What does the test measure and why? Testosterone: This male sexual hormone is responsible for building muscles and reducing fat. As part of the natural aging process testosterone levels start declining in mid-twenties. This decline affects weight gain, muscle and bone loss, reduced sexual desire, fatigue, mood swings, and anxiety. Knowing testosterone levels helps determine how your results look for a normal aging process. Di-hydro-epi-androsterone (DHEA): A precursor to testosterone and estrogen, DHEA peaks even before testosterone in youth. Excess levels can be an indicator of problems with adrenal glands, however, normal levels vary by age. Cortisol: An indicator of our stress levels, cortisol plays key role in metabolism by breaking down muscles and bones. High levels of cortisol result in weight gain around waist, overall immune suppression, and fluid retention in the body. Cortisol levels follow the diurnal pattern, highest in the morning when we are most energetic, and gradually decrease throughout the day. Estradiol: The most common form of estrogen, estradiol is a female hormone but also found in men in low levels. Studies have shown it to play key role in male sexual health in combination with testosterone. Estradiol has been associated with mood swings and depression as we age. How to get tested for Male Health? The easiest low-cost way to get tested for men’s health is from the convenience of your home. Simply order a Male Health test kit, collect a saliva sample, send your sample to our CLIA-certified labs, and find out your levels in less than a week. For more information on each of these hormones please see: All About Testosterone, All About Cortisol, Estradiol, and brief description of DHEA from from Webmd or Mayo Clinic. Q: Can I purchase the test across US? A: Except New York, New Jersey, Rhode Island, and Maryland our tests are available in all 46 states. State regulations in NY, NJ, RI, and MD do not allow us to ship the tests to their residents. Q: What does the kit contain and how do I use it? A: The kit for our at-home Male Health test contains a vial to collect saliva, instructions on how to collect the sample, and a form requesting basic information including date and time of collection. The directions are straight forward and easy to follow. Q: How long does it take to receive the results? A: You will receive the kit within 3-5 business days with a prepaid return envelope. After you ship the sample and it is received by our lab, you get the results within 5 business days. Q: What do I expect from the report? A: The report with your test results will be easy to understand and will have all the necessary details. It will mark your levels for T, C, DHEA, E2 on a range expected for healthy levels. The report will also specify what are the expected low and high ranges. It will briefly discuss what your numbers mean and what next steps should be taken to maintain healthy levels. Q: Can I use my insurance to pay for the test? A: You can use HSA (or FSA/MSA/HRA) accounts to pay for the tests since these are prescription tests (for further confirmation, please check the IRS publication#969). However, please ensure you are not going outside your specified max and min deductible limits. We do not have the capability to process the insurance claim. Insurance plans vary by individuals, therefore we can not guarantee your HSA payment will always be processed by your plan. Please talk to your insurance provider if you have any further concerns. Q: How reliable are my results? A: We have partnered with CLIA-certified labs that are used by physicians across the US. These labs are regulated by the states, as well as Centers for Medicare and Medicaid Services (CMS). Majority of the tests from these labs are FDA approved to ensure they meet the proper regulatory requirements. Additionally, the College of American Pathologists (CAP) requires inter-laboratory tests to ensure the ranges established by each lab do not drift or are not out of acceptable ranges. This is done by regularly testing reference samples between different labs. Finally, the labs test thousands of sample for different age groups and health conditions, and have well established reference data to compare your results against this large pool. Q: Can you recommend what therapy should I take if my levels are low? A: Unfortunately, no. As a lab test provider we can only test and report out data from your samples. We are not authorized to provide any medical recommendations. But we strongly encourage you to discuss the results with your doctor for next steps. It is recommended to monitor the cholesterol and lipid levels every 6 to 12 months for a healthy heart. 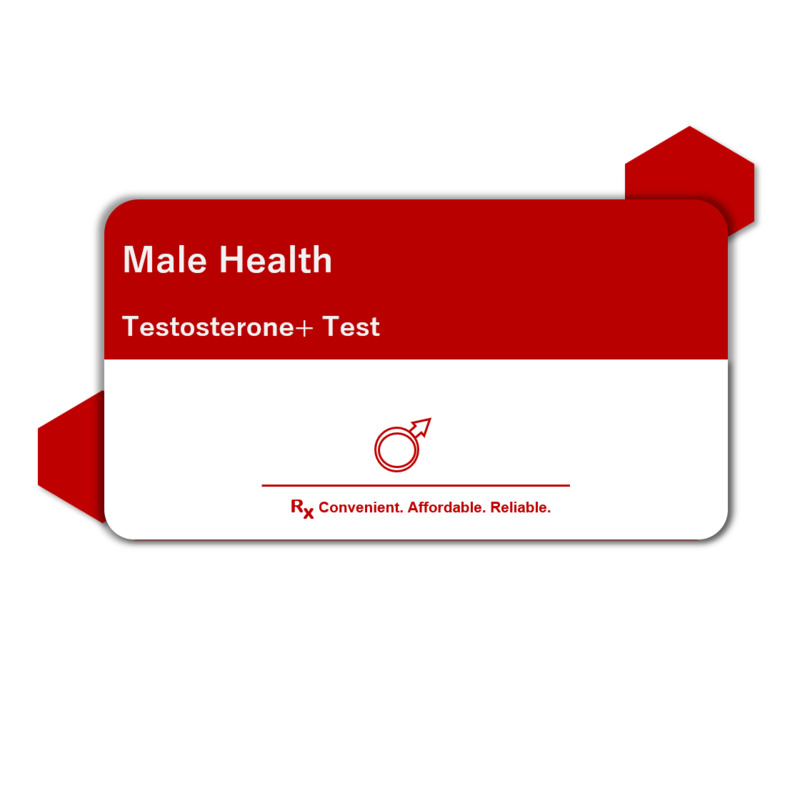 A quick Male Health test ordered from home can help check all your key male hormone levels and assess whether you need to make any life style changes to bring your numbers to normally recommended levels for your age. 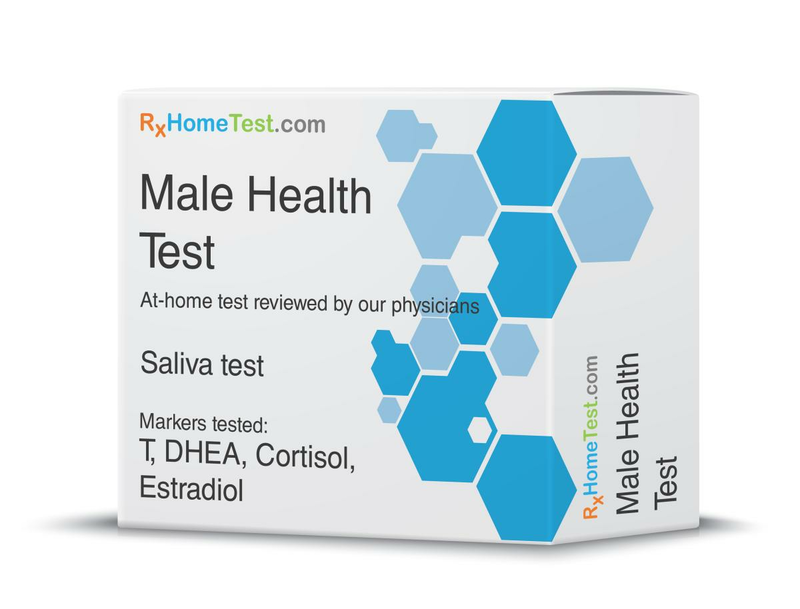 At-home Male Health test from RxHomeTest.com can help you understand potential risks arising from an imbalance of hormones. High cortisol and low testosterone levels can be very detrimental to your health resulting in weight gain, slow metabolism, and loss of bone density and muscles. An at-home Male Health test can help you assess your levels right from the comfort of your home. Better health results in better quality of life, and an at-home health test for men from RxHomeTest.com can offer insight not only into various health symptoms, but it can serve as a motivation to treat each of these symptoms and have a better quality of life! Still wondering where to get a men’s health test? Each at-home health test from RxHomeTest.com includes a physician’s prescription and review of the final results. All orders include a detailed report with your test results explained clearly in a manner that you can understand. RxHomeTest.com is one of the best places to get men’s hormone levels tested as we process your tests at the same CLIA-Certified labs that other physicians use but no lab or doctor visit is required. So rest assured that your saliva test to check hormone levels is being processed in a world class lab. RxHomeTest.com offers one of the best tests for men’s hormone levels with convenient, confidential, and reliable results at some of the lowest prices in the market. At-home Male Health test is quick and easy, can be ordered online, and doesn’t require a doctor’s visit or prescription. This saves time and money on visits to the doctor and the lab. The at-home Male Health test ordered at RxHomeTest.com, requires just a vial of saliva and is especially useful to those afraid of needles. The test includes a doctor’s prescription and review, two day free return shipping, and you get results within a week.